KMU students are attracting attention because they participated in a fair together with smaller businesses aimed at opening overseas market. GTEP - Glocal Trade Experts incubating Program is a local business group that trains young trade experts. 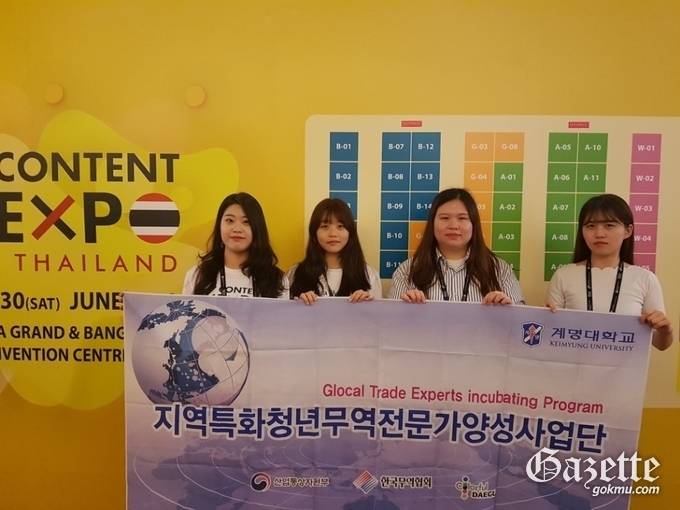 GTEP students participated in the ‘2018 Singapore Information and Communication Fair’ on June 24, the ‘2018 Bangkok K-Content Expo’ on June 26, the ‘2018 Tokyo Summer Health and Beauty Expo’ on July 3, the ‘2018 Shanghai ISPO' on July 4, the ‘2018 K-Beauty Show' held in Thailand on July 11 and the '2018 Character Licensing Fair' held at COEX in Seoul on July 17 together with smaller businesses. Students got favor with their cooperative firm by playing all roles from planning to counseling and achieving results. As a result, they signed an export contract of $ 12,600 and continue to have export consultations with foreign companies after the fair.